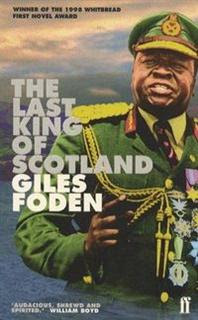 Saw the long-awaited film version of the Giles Foden novel about a young Scottish doctor taken under the wing of vicious, unhinged but quite personable military dictator Idi Amin. It is a brilliant film, with a standout performance from Forest Whitaker as Amin, and a solid centre in James McAvoy's Nicholas Garrigan. What the film brought out that I hadn't sensed quite as clearly in the novel was Garrigan's identifying with Amin's dislike of the English ex-pats as the son of another "colonised" nation. However, I have illustrated this entry with the cover of the novel because, as good as the film is, it doesn't have the same grandeur as the novel, which can take it's time and show more of Garrigan's experiences among the ordinary people of Uganda. The time he spends at the rural mission take up more than a third of the book but are skimmed over in the film. Making it seem as though he spends only a few days there before being appointed Amin's personal physician. The character of the other ex-pat Doctor at the mission is also reduced substantially, and this is to the film's detriment as it is from this man that Garrigan learns the practical side of medicine and how to recognise and treat particularly African problems.